Goodyear has launched a new range of mixed service truck tires which offer optimal damage resistance and longer service life than previous tires and come with a guarantee for accidental damage and retreading. The new OMNITRAC range comprises tires having DuraShield technology and not only have greater robustness but also deliver retreadability and enhanced performance. Goodyear specifically developed the new tires for vehicles which are used for mixed service applications and might regularly face the difficult conditions of unpaved sites but are mainly operating on roads. Vehicles of this type include tippers, cement mixers, concrete pumps and low loaders which are used in the construction sector as well as trucks in waste, recycling, timber and agricultural industries. The new Omnitrac range includes 10 sizes (six Omnitrac S steer tires and four Omnitrac D drive tires), including one new to the mixed service industry. 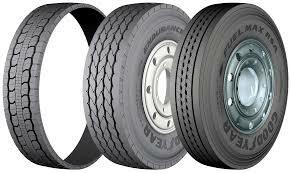 This new size, 315/70R22.5 covers the growing trend for the use of standard tractors in this market sector. DuraShield is a new technology that Goodyear is launching and involves the use of an exclusive top belt for extra resistance to casing damage. This also improves retreadability. The new Omnitrac range offers improved service life and full 3PMSF compliance to meet ever tougher winter tire requirements. Commenting on the new range, Benjamin Willot, Director Marketing Commercial Tires Europe at Goodyear said that currently, mixed service fleet operators need demanding tires that offer both versatile on-road capability and greater resistance to the conditions encountered both on- and off-road. Goodyear’s new Omnitrac tires are significantly better than the company’s previous range and now come with DuraShield technology to make them even tougher and offer longer service life. They are so strong that the company is offering guarantees against accidental damage. The OMNITRAC S steer axle tire is developed to tackle specific conditions encountered in modern construction industry and similar applications. They are meant for a high level of highway use as well as off-road use on sites. This tire offers good on-road wear performance, significantly high levels of resistance to tread damage and excellent retreadability due to the innovative DuraShield technology. The new OMNITRAC D drive axle tire has a tread with three rows of directional siped blocks. These blocks optimize performance on highways and in winter. The OMNITRAC D provides good on-road wear performance, excellent traction on all surfaces throughout its life, longer service life and guaranteed retreadability. Thanks to DuraShield technology, casing durability and resistance to tread damage are significantly enhanced with a high level of chip/chunk resistance under torque including that from retarder operation. Goodyear OMNITRAC MST II 385/65R22.5 and 445/65R22.5 trailer tires complement the new OMNITRAC S and D tires which offer high mileage and better grip for on- and off-road applications. These tires come with a wide tread and offer even wear and high mileage potential in addition to high stability and outstanding damage resistance.